Granting you the confidence that your feet will stay put when ripping through rough terrain is the key attribute of clipless pedals. 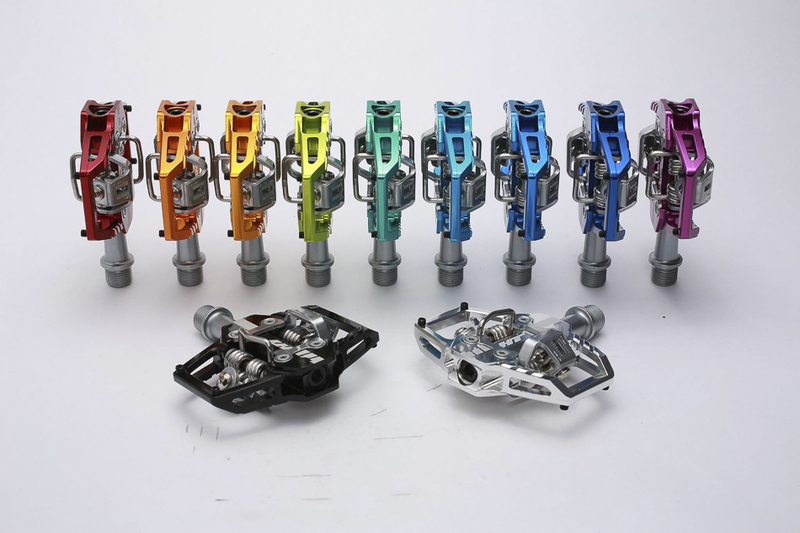 Although there are many pedal brands out there, Shimano and Crankbrothers are consistently atop the popularity pecking order. Lesser-known brands, like HT Components, have gained recognition of late by sponsoring headline-grabbing riders like Aaron Gwin, Antoine Bizet, Kyle Strait, Jerome Clementz and Brian Lopes. Taiwan’s Hsing Ta Industrial has been in the bicycle game since the 1950s, and its HT Components brand was born in 2005. 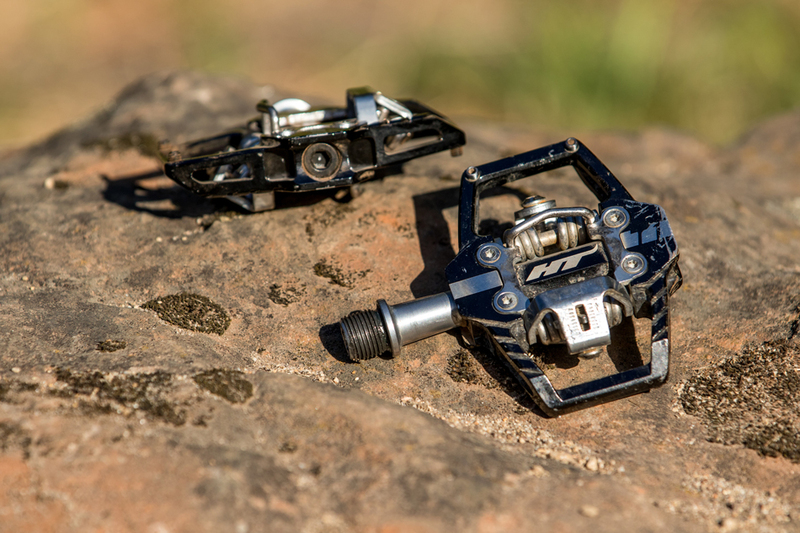 The T1 is HT's flagship trail pedal. It’s available with either titanium or chromoly spindles and in a whopping 11 colors. The T1 separates itself from a traditional cross-country-style clipless pedal with an aluminum outer-platform area (nearly identical in size to Shimano's popular trail pedals), and two replaceable traction pins at the front of the outer cage for bit of grip for those hairy unclipped moments. The thin, 17-millimeter profile provides clearance over chunky terrain, while a proprietary clipless retention system grabs the cleat. The chromoly spindle T1s sell for $135, and include two cleat options: one with 4 degrees of float and one with 8 degrees. My pair of chromoly T1s weighed 370 grams. From a few feet away, the adjustable retention mechanism and pronounced spring area bear the resemblance of a Shimano and Crankbrothers lovechild, but from the first spin the T1's unique feel was evident. 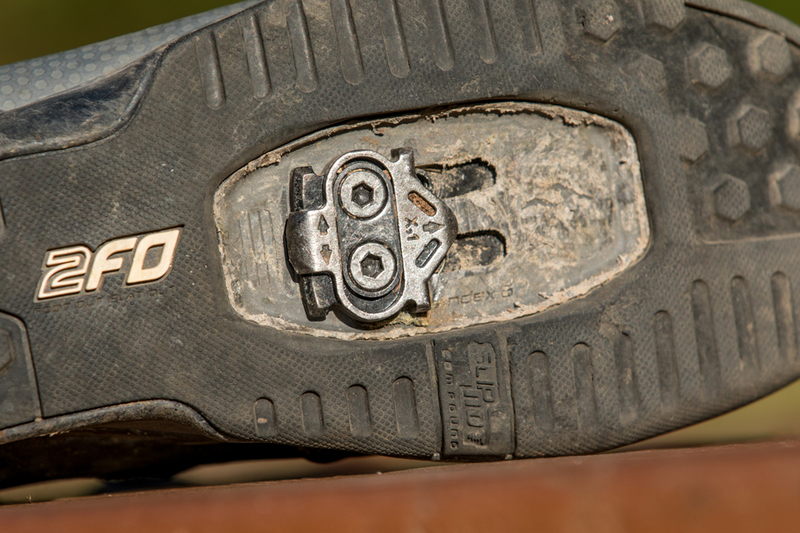 I prefer very firm cleat retention–I crank down SPD tension to the maximum setting–but also minimum float. The peace of mind of having my feet remaining in place is important to me, yet I want the cleat to completely disengage in a split second when I go to unclip. The T1's retention feels significantly tighter than what I’ve come to expect from Shimano, and I've settled on running only nine out of the 19 clicks on the tension adjuster. I've also experimented with both cleat options. The X1 has 4 degrees of float, which allows ample foot movement, yet also disengages pretty quickly. The X1F cleats are claimed to provide 8 degrees of float, and the difference is very noticeable. On a few occasions when trying to unclip with the X1F cleats, I felt the same amount of retention when my heel was pointed toward 9 o’clock as in the usual position near 6 o’clock. The T1s are slim enough to avoid the most obvious obstacles, but they've certainly held up to some harsh impacts. After a few months of ripping around on the HT pedals, it seems to me that they combine the best attributes of both of the most popular brands in one design: reliable retention at speed on rough terrain, plus ample amounts of float for riders preferring more wiggle room.